I hate getting sick. Touch wood…reaches for wooden desk and taps vigorously…I rarely get sick. I get a flu shot each year without fail. In fact, I haven’t missed a flu shot since the flu shot shortage of 2004 or so. My children and husband each get a flu shot. Still the flu shot can only protect against the flu. I rarely, if ever, get the flu, but I have had a bout or two of the stomach flu. Ick. My worst bout with the stomach flu was also my worst sickness experience. Ever. I’m generally only sick when I am at home, but about two years ago I was sick on a trip. It was awful. I was staying in Philadelphia with my family. My teen had a 3-day volleyball tournament. We roadtripped to Philly to cheer her on. My daughter stayed in a hotel room with a couple of her club volleyball teammates, while my husband, my younger children, and I got a room in the same hotel. The first day was amazing. My teen played well in her first two games. At the break she went to lunch with her team, while my husband and I took our younger children took a bus tour of Philly followed by lunch out and then dinner at the hotel. I woke up in that hotel room at 1 a.m. I was violently ill. I continued to be sick. I slept when I could. I have never been so ill. My husband took the kids out to watch my teen’s volleyball games and see more of Philadelphia while I rested at the hotel. I was exhausted. I was not eating. The only thing that I could keep down were sports drinks. I’ve never been a sports drink drinker. I give sports drinks to my children. They all play sports. Since I don’t play sports, I have never had a use for sports drinks until I was so very sick. Sipping sports drinks gave me the hydration I so desperately needed. The sports drinks, I am sure, also replenished my badly depleted body of the electrolytes I so sorely needed. As the day wore on and my sickness subsided, I felt better. I wasn’t 100% back to my normal self, but I felt better after lots of rest. With three kids involved in sports…and a husband who plays sports too…I want them to be ready… To play their best volleyball game. Swim their hardest. Save all the soccer goals. I want to give them sports drinks to rehydrate them and replenish them. I worry about all the sugar and preservatives in sports drinks. I was intrigued to hear about BODYARMOR SuperDrink. BODYARMOR SuperDrink is an all-natural sports drink. BODYARMOR SuperDrink is packed with electrolytes that are packed with potassium, vitamins, and coconut water. BODYARMOR SuperDrink also contains nothing artificial. Traditional sports drinks’ key electrolyte is sodium, but BODYARMOR SuperDrink’s key electrolyte for rehydrating and replenishing the body after sports and exercise is potassium. Of note to anyone, like me, who is subject to leg cramps, potassium prevents cramping. BODYARMOR SuperDrink has plenty of potassium to prevent muscles from cramping. BODYARMOR SuperDrink has more electrolytes, more vitamins, more potassium, but is lower in sodium than traditional sports drinks. 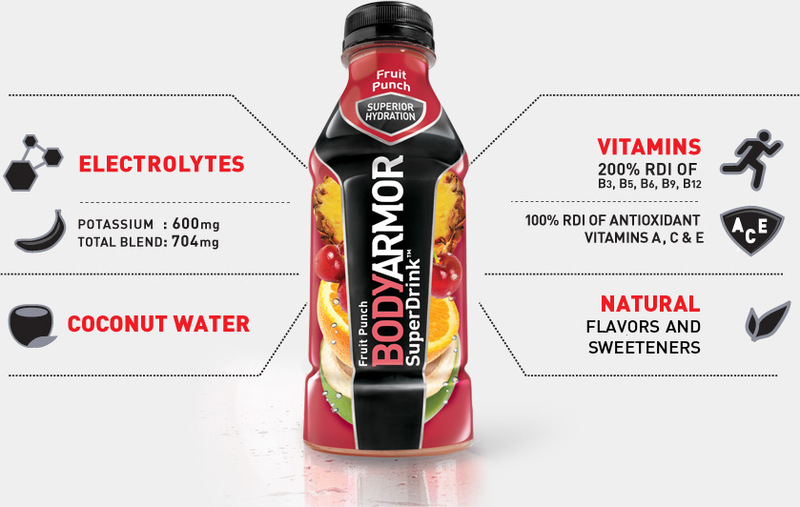 BODYARMOR SuperDrink contains nothing artificial and has only natural flavors, colors, and sweeteners. Parents of athletes will be pleased to know that BODYARMOR SuperDrink is not an energy drink since it contains no caffeine. I know I would rather not give caffeinated beverages to my children. BODYARMOR SuperDrink is also vegan, gluten free, nut free, and soy free. It is also certified Kosher. BODYARMOR SuperDrink is available at Target, Wegmans, Mars, and Royal Farms in Maryland. It is also available at High’s, 7-11, and Shoppers Food. Or you can purchase online at DrinkBodyArmor.com. Want to Try BODYARMOR Super Drink? Click here for a coupon for $1 Off 2 bottles of BODYARMOR Super Drinks.